An A3 workbook and electronic syllabus book are combined for a unique and interactive learning experience for students of Design and Communication Graphics. 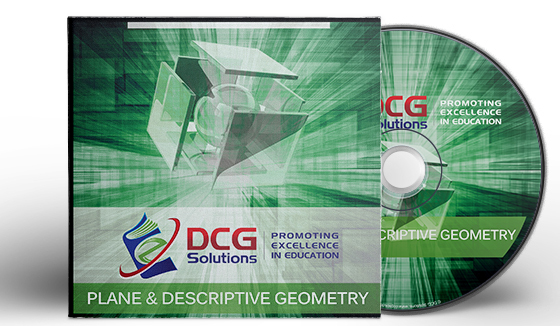 • Covers the complete Plane & Descriptive Geometry (Core) section of the syllabus, The Applied Graphics options are sold separately. Student Packages can be purchased direct from DCG Solutions or from a number of local bookshops. Click here to find a Local Retailer. This interactive student package is designed to cover the complete Plane & Descriptive Geometry section of the syllabus and prepare students for the Leaving Certificate exam while promoting understanding of the topics covered. It will not only enable students to solve higher level problems but will encourage understanding of the material covered through 3D representation. The electronic book includes over 330 worked questions while the workbook consists of over 170 sheets which compliment the electronic book; these are designed to be used for a two year period corresponding to the Leaving Cert Cycle. The e-book will run for a cycle of two years. In addition to the questions within the workbook the e-book also contains an additional exam section; within this section are interactive solutions to the recent Leaving Certificate Exams. This interactive student package is designed to cover the complete Plane & Descriptive Geometry section of the syllabus and prepare students for the Leaving Certificate exam while promoting understanding of the topics covered. It will not only enable students to solve higher level problems but will encourage understanding of the material covered through 3D representation. The electronic book includes over 330 worked questions while the workbook consists of over 170 sheets which compliment the electronic book; these are designed to be used for a two year period corresponding to the Leaving Cert Cycle. Access to the DCG Student Package E-books correspond to the Leaving Certificate Cycle and will expire after two years. In addition to the questions within the workbook the package also includes interactive solutions to the recent Leaving Certificate exams. © DCG Solutions. All Rights Reserved. This publication falls under the list of excluded categories under the ICLA Licence for Educational Institutions. No part of the DCG or TG Solutions Student Package publications may be copied, reproduced or transmitted in any form or by any means without written permission of DCG Solutions. Single Purchases – Single Copies are licensed for private and individual use only, public display of the E-book in a classroom or otherwise is strictly prohibited without written permission of DCG Solutions. Photocopying of the accompanying worksheets is prohibited without written permission of DCG Solutions. Teacher Copies – On ordering for the class the teacher will receive an additional copy for teacher use within the classroom. Display of the Teacher Copy provided is permitted with the classroom. to our online E-book is at the sole discretion of DCG Solutions.